Background: The measurement of tissue stiffness by elastography is increasingly used as a noninvasive biomarker for hepatic fibrosis. Various elastography methods have been developed for MRI or ultrasound, which rely on the mechanical stimulation of soft tissue by static deformation or dynamic waves. To date MRI elastography (MRE) is the most accurate imaging modality for staging hepatic fibrosis. MRE exploits time-harmonic vibrations which are able to induce shear waves into the whole body. Problems: MRE suffers from long scan times particularly for cardiac applications. Synchronization to the heart beat requires repetitive mechanical excitations and MRI signal acquisitions. Therefore, the Charité group invented steady-state MRE with fractional motion encoding . In principle, the same elastodynamic information of myocardial stiffness alterations during the heart beat can be acquired by ultrasound, however, at a fraction of time and costs imposed by MRE. Purposed Solution: We developed an A-line cardiac ultrasound elastography system and a real-time processing algorithm capable to analyze shear wave amplitudes. It is known from cardiac MRE that externally induced shear wave amplitudes decrease during myocardial contraction and re-increase while the heart wall is relaxed. The principle of time-harmonic ultrasound elastography has been studied in the hearts of healthy volunteers  and is being extended to other organs such as the liver. In the liver, inversion of the captured complex shear waves is required for the reconstruction of quantitative elasticity values (see figure 1). Figure 1: automatically fitting of a model function to the liver-shear wave (healthy volunteer, 30 Hz vibration frequency). 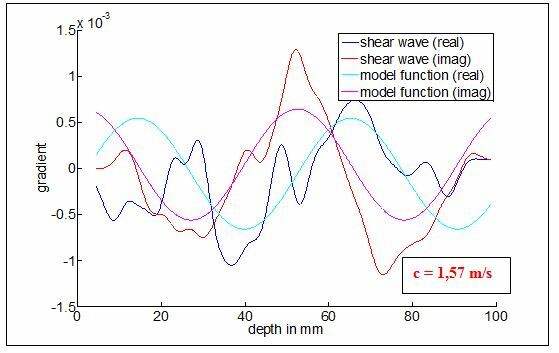 The result of this operation is the shear wave speed c which correlates with the quantitative elasticity values. Rump J, Klatt D, Braun J, Warmuth C, Sack I. Fractional encoding of harmonic motions in MR elastography. Magn Reson Med 2007;57(2):388-395. Tzschatzsch H, Elgeti T, Rettig K, Kargel C, Klaua R, Schultz M, Braun J, Sack I. In Vivo time harmonic elastography of the human heart. Ultrasound Med Biol 2012;38(2):214-222.